Kennesaw State University student, Kendra Thomas, completes internship with Bartow County’s Information Technology Department. Before working with Bartow County’s Information Technology Department, Anthropology major Kendra Thomas was unfamiliar with the operations of county government. Upon completing her internship, Thomas has a newfound appreciation of the scope of the work of county government, remarking that she was unaware that "county government deals with a variety of different topics from transportation to medical billing", while also recognizing the teamwork amongst the departments that is necessary for the smooth operation of the county government on a daily basis. 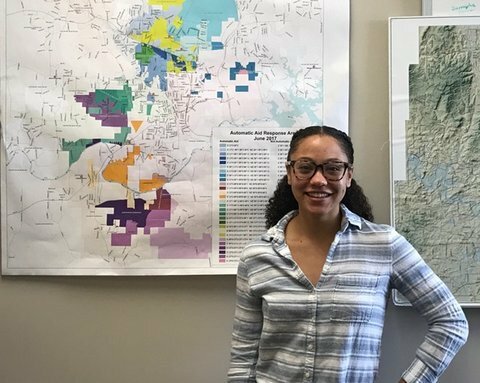 Throughout the course of her summer, Thomas worked on a sidewalk data collection project, focusing on mapping and analyzing data pertaining to pedestrian access to sidewalks and resources throughout Bartow County. She worked alongside the Bartow County’s GIS Coordinator and programmers and assisted them on several other ongoing mapping and data analysis projects along the way. For Thomas, her biggest success during her internship was the gathering of data and map production for the sidewalk project. In the end, Thomas was able to produce an online interactive map that was used in determining areas within Bartow County that need access to sidewalks given their close proximity to retail, medical, and governmental facilities. Thomas relished the opportunities that she had to learn from her coworkers, who supported her and enabled her to gain the most out of her internship experience. The GIS experience gained by Thomas will be greatly assist her in attaining her GIS Certificate at Kennesaw State University and her newfound skills working with census data greatly complemented the GIS and mapping skills that she already had. For future interns, Thomas advises that there is no better introduction to the GIS world than through an internship, as it gives you a great opportunity to get hands-on experience using the technology. Based on her experience, Thomas will strongly consider a career in county government.